The Hubspot integration enables you to access your CRM contacts right in LiveChat. There is no need for switching the applications. You can have important customer data within reach and use it to handle a well-tailored conversation with a customer. 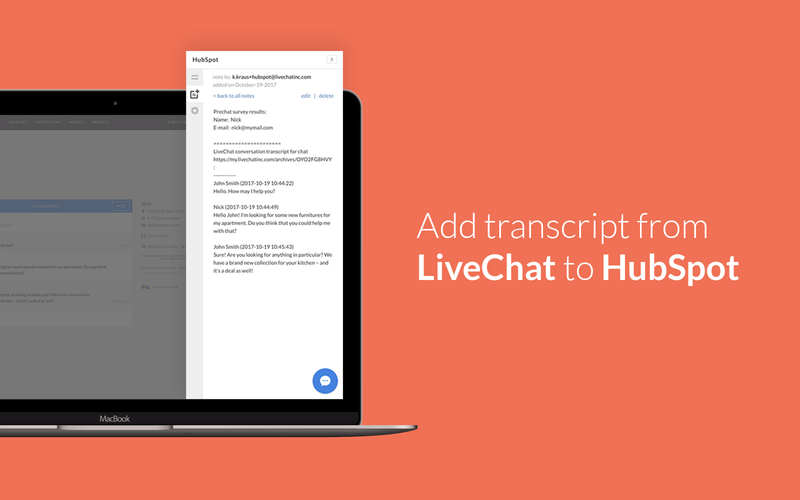 To add to this, you can add a chat transcript to a given contact or send a customer contact from LiveChat to HubSpot without mishap. HubSpot CRM is a user-friendly solution that helps to create contact and company profiles as well as organize, track and nurture your leads and customers. Salespeople love HubSpot CRM because it automates plenty of repetitive tasks. The tool has the intuitive interface and comes with a detailed dashboard that allows keeping track of different company's activities. It lets you keep a close eye on your sales efforts, the performance of your agents and leads’ behavior. You can also view every interaction with a potential customer on a timeline: calls, emails, meetings, and notes. What's more, HubSpot integrates with the phone and social media as well as such tools and services as MailChimp, WordPress, Zapier or Slack. Thanks to this solution, you can easily import leads from emails, spend less time arranging customer data, and eventually, close more deals. Use the integration to manage your Contacts wihout leaving the LiveChat app. If a customer is already on your contact list, LiveChat will automatically show you his details. And if not, you can add them straight away! Use the saved time to focus on what's most important to your business – closing more deals. Add chat transcripts as notes and use them to establish a better relationship with your customers! What's more, you can edit your Notes so that they include additional details about your customer! What's a better way to show your customers that you care about them than by mentioning some little detail from your previous conversation? You can use your Hubspot app as a chat widget, available right under the Customers Details. It allows you to not only quickly add your customers as Contacts, but also save a transcript of a conversation as a Note! All of that with just a single click of a button. All website visitors are essentially sales opportunities. Once installed, LiveChat makes it easy for you to talk to leads, build better relationships, and close more deals. 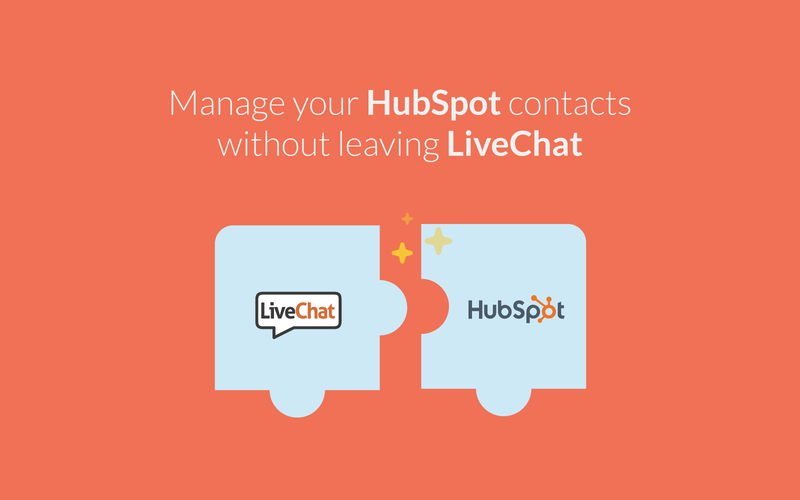 Start using LiveChat with HubSpot now!